Cooking With Carlee: Southwestern Black Bean and Spinach Egg Rolls: Made by Cori! 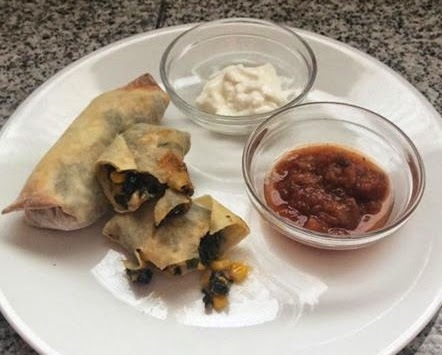 Southwestern Black Bean and Spinach Egg Rolls: Made by Cori! Cori really outdid herself for our virtual Super Bowl party! She was eating good. She knew her stuffed mushrooms would have us all drooling. She has seen us gorge ourselves on them before. These, however were a fun new recipe. We may have to plan a family gathering soon so that we can try them in person! She said she has made these a few times and has really enjoyed them. She likes to dip hers in sour cream and homemade salsa. YUM! I am definitely going to have to try these soon! You don't know how excited when I read that you bake these Cori. I must make them! Thank you so much for taking the time to read and comment. I love reading your ideas! This post may contain affiliate links. Please view my disclosure page for more information. All contents and pictures are copyright protected. Permission must be granted for use.. Powered by Blogger.